Mathew Elenjickal, Founder & CEO When Mathew Elenjickal established FourKites in 2014, he had a strategic plan, and that was to address a key gap in the logistics space—the lack of real-time visibility of trucks and shipments. It’s not an easy task to change the traditional methodologies; but with years of experience at tech giants—including Oracle and JDA—leading high-impact teams who were implementing innovative logistics strategies at companies— including P&G, Nestle, and Kraft—Elenjickal had the answer, and it was to build an ecosystem of connected devices already installed in tractors, trailers, rail cars and ocean vessels. “Most of the time, while managing shipments throughout the supply chain, companies lose visibility of the shipment once a truck leaves the facility. They are left with little to no information on the current status of the shipments— information about any mishaps or delays reaches them too late. On one side, the inventory awaits the customs review and on the other, the supplier awaits payment—any delays would knick the entire supply chain cycle,” explains Elenjickal, the Founder & CEO at FourKites. “We intend to change this situation,” he adds. Taking a leaf out of these market pain points, FourKites offers a slew of solutions that help spot risks and track orders to provide real-time supply chain visibility across transportation modes and digital platforms. The Chicago-based solutions provider has developed an array of new technologies that pierce deep into the supply chain. Over the years, Electronic Data Interchange (EDI) technology has been helping shippers track their carriers. However, the real-time challenge arrives when an unforeseen situation happens on the road, disrupting the regular logistics process. Elenjickal feels that EDI is far from a perfect mechanism to track shipments because of the delay in fetching timely information. “The Federal Motor Carrier Safety Administration has mandated the use of ELDs in commercial trucking by the end of 2017, which means a lot of data will be generated in the coming years. The problem we see in the market is not the lack of data, but how to consume it in a controlled fashion and make sense out of it for all the entities that care,” he explains. FourKites is in a unique position to help shippers, brokers, and carriers effectively handle the data explosion in the logistics space. The firm’s proprietary technology helps in getting the estimated arrival time, real-time location status, and proactive exception management alerts for all the active shipments. For example, a big trucking company might not be willing to share its entire fleet data with their Shipper and 3PL customers. “With EDI, the companies end up sharing their data in a controlled fashion after the fact. Hence, enabling data control in real-time emerges as a new problem in this sector. There is no technology in the market that does this effectively. We were the first to consolidate information from various GPS devices and provide real-time exception management for Shippers and 3PLs by selectively sharing relevant fleet data with them” he asserts. With FourKites, trucking companies can filter the amount of data they share with the 3PLs. For this reason, Elenjickal feels FourKites real-time connectivity platform to be much better than regular EDI. Another key trend in the logistics industry is the rapid change in consumer expectations. “Earlier, shippers were happy with the delivery updates once a day, but with online retailers like Amazon pushing for next-hour delivery, there is a tremendous up-stream pressure on manufacturers and distributors to provide real-time information on shipments. FourKites makes the entire supply chain process non-disruptive for shippers with its robust shipment tracking platform, which, in-turn, helps deliver the goods on time,” he states. “Shippers often outsource their supply chain management process to third-party logistics companies (3PLs) to collaborate themselves with the right kind of transportation service. Globally, the 3PL market is estimated to be over 750 billion dollars. Now, the rapid delivery chain has put 3PLs under tremendous pressure as customers demand more and pay less,” observes Elenjickal. Trouncing the hurdle is FourKites’ Comprehensive Real-Time Tracking Platform that makes the process simple by creating a communication channel to connect 3PL’s directly with the carrier community at a lower cost. 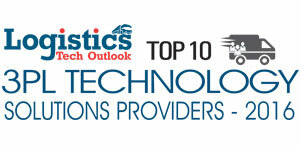 Today, FourKites is deployed at five of the top ten 3PL’s in the country. Being platform agnostic, FourKites’ real-time location tracking gives shippers, brokers, and 3PL companies full visibility over all of their freight loads moving in their supply chain network regardless of the Transportation Management System (TMS) in place. FourKites is integrated with industry leading TMS providers such as JDA and OTM, which allows mutual customers to receive FourKites’ tracking updates directly in a platform that they already use and are familiar with. A recent study by DAT reveals that 63 percent of the drivers are detained for 3 hours or more at every stop due to non-availability of a good tracking system, and FourKites eliminates this challenge with the help of a robust geofencing system—creating automated arrival and departure alerts at regular intervals thus enabling all the parties to be ready for the impending arrival. Another highlight from FourKites is its CarrierLink app that helps brokers and owner-operators to sync in real-time without any external hardware. “In addition, our load tracking products increase driver-safety by eliminating check calls and limiting driver distractions. Brokers can enhance customer service by having real-time information at their fingertips, improving their drivers' and their own experiences and reducing wait time at loading docks,” says Elenjickal. FourKites’ collaboration with US Foods, one of the USA’s largest food distribution companies, perfectly reflects their expertise in the industry. The food distribution chain chose FourKites’ real-time load tracking platform to help modernize its logistics operations.Post implementation, the firm was able to access real-time location information and the ETAs of every truck carrying its products. Impressed with the results, the food chain is now planning to roll out FourKites platform beyond the logistics customer service team. “With sales, warehouse operations, and other internal teams all on the same page, they can reduce redundancies and streamline operations, providing the same great customer service more efficiently,” adds Elenjickal. FourKites recently hit the headlines for raising $13 million in Series A funding led by Bain Capital Ventures (BCV). The funding will be used to integrate more data sources into its tracking platform, expand internationally, and cover additional transportation modes such as LTL, rail, intermodal, and ocean. "FourKites’ Comprehensive Real-Time Tracking Platform creates a communication channel to connect 3PL’s directly with the carrier community at a lower cost"
The company is currently working on aggregating trailer temperature to help food and produce shippers comply with the Food Safety Modernization Act. “Our temperature reporting module will be integrated to all the major trailer tracking device manufacturers. The innovative reporting system can track and automate trailer temperature exceptions as and when they happen in the supply chain. It will be launched in 2017,” reveals Elenjickal. Meanwhile, the team at FourKites has also launched predictive analytics for trucks management— offering suggestions and predicting arrival times based on weather and other conditions. FourKites is also planning to launch a global version of the tracking platform later this year, followed by its Spanish, Portuguese, and French versions. Elenjickal acknowledges his company’s success to its unique working culture where teamwork and collaborative nature plays a key role. Couple this with Elenjickal's flair for innovative and thoughtful leadership in understanding the market gap—and the result is the right solutions to address market pain points. “We believe in developing solutions from the market challenges and for that, we invest in teams of great people who can execute it with a dash of creativity,” he signs off.